What do you think of Trenberth’s recent paper on ocean warming (attached)? They obtain an ocean warming, for 2000-2009, of 1.19 W/m2. is applied in the Balmaseda et al 2013 paper. This, as I reported in my Physics Today article, is the much more robust approach to assess global warming and cooling, than using the global annual average surface temperature trend. The Balmaseda et al paper is a step forward in understanding the changes of heat content. 2. However, there are substantive, unanswered questions that their paper introduces. (ii) Moreover, how could this heat be transferred to depths below 700m without being been seen in the upper 700m of the ocean? [and this is a question also on the transfer of heat to between 300m and 700m without being seen in the upper 300m]. This absence of observable heat transfer through the upper 300m of the ocean is an issue that must be resolved. 3. There are also major implications for their findings even if they are robust. the latest decade being significantly higher (1.19 ± 0.11 W m-2). While, this is larger than found in the past, it is still less than the best estimate of the global average radiative forcing reported in the IPCC 2007 report (1.6 ± 0.6 to 2.4 W m-2 total net anthropogenic plus 0.12 ± 0.06 to 0.30 W m-2 from solar irradiance changes). Since their reported diagnosed radiative imbalance for the last decade is 1.19 ± 0.11 W m-2 – which includes both the radiative forcings and all of the feedbacks (including from water vapor), this indicates that either the IPCC best estimate of the total radiative forcings by the IPCC is in error, and/or the radiative feedbacks in the climate system are a net negative. about 30% of the warming has occurred below 700 m.
this means that this heat is not being sampled by the global average surface temperature trend. Since that metric is being used as the icon to report to policymakers on climate change (i.e. paraphrasing from other sources “we need to remain below a +2C change”), it illustrates a defect in using the two dimensional field of surface temperature to diagnose global warming. If this is a real effect, than this is a muting of the radiative effect as this deep layer warming is unlikely to be reemitted back into the atmosphere in short time periods in large amounts (of Joules) as it would diffuse horizontally and vertically, at depth, in the ocean. (iv) Also, the latest real world measurement of upper ocean heat content; [see the attachment in my e-mail from http://oceans.pmel.noaa.gov/] continues to show, little if any significant recent warming. (v) Finally, with respect to the change in slope, this occurred when the ARGO network achieved world-wide coverage. This raises the suspicion that it is the date quality and coverage that remains more of an issue before 2003 than concluded in Balmaseda et al paper when they excluded the ARGO data. Please let me know if you have any follow up questions. Thank you for the opportunity to comment. …the following graphs from the post NODC’s Pentadal Ocean Heat Content (0 to 2000m) Creates Warming That Doesn’t Exist in the Annual Data – A Lot of Warming came to mind. 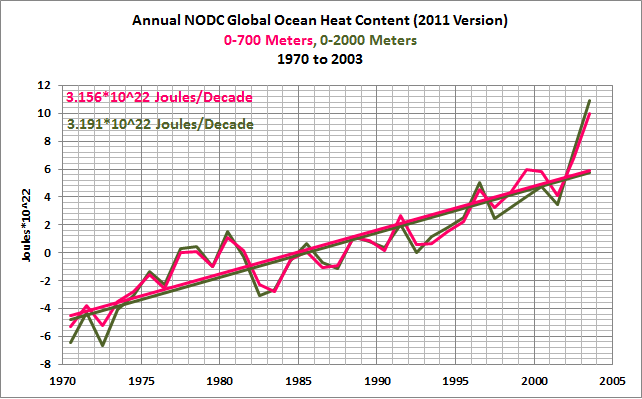 Kind of odd that the NODC’s annual ocean heat content data for 0-2000 meters, Figure 1, should warm hand in hand with the data for 0-700 meters from 1970 to 2003. But then as soon as the ARGO floats are deployed and have close to full coverage of the global oceans, the datasets diverge, Figure 2. 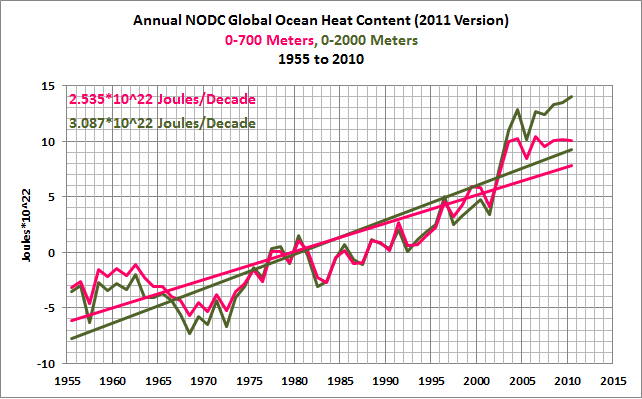 Does anyone want to speculate about why the NODC removed their long-term annual ocean heat content for the depths of 0-2000 meters from their website? 18 Responses to Even More about Trenberth’s Missing Heat – An Eye Opening Comment by Roger Pielke Sr.